Why a post about how to supercharge your circadian rhythms? The fact is that for a lot of us our bodies and our brains have a hard time adapting to modern life and the result is poor quality sleep, daytime fatigue, and, for some, depression. 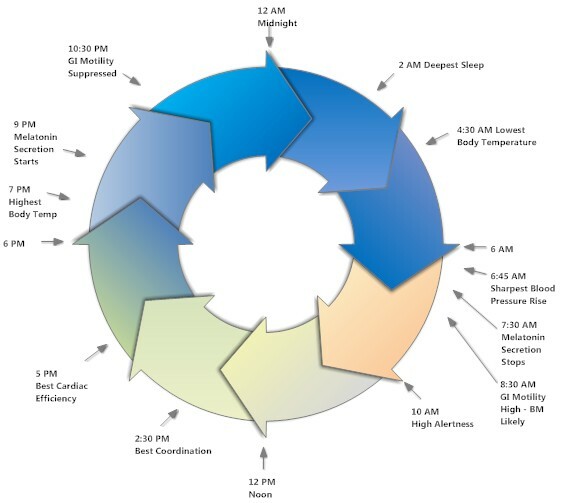 Circadian rhythms are what allow your body to go from vigorous wakefulness to deep sleep at the right time every day. Think of hundreds or even thousands of separate clocks that determine processes such as body temperature, release of various hormones, activation of different parts of your brain, activation and deactivation of your immune system, etcetera. The separate clocks all have to align with each other in order for the system to function properly. What makes them follow the same daily schedule, what sets the clocks to the right time, is a central timekeeper in a small but important part of your brain called the pineal gland. That timekeeper itself is set to the proper time by exposure to a regular pattern of light and dark exposure. Why Do Circadian Rhythms Get Dysregulated? Depression. People with depression and bipolar seem to have less effective central clocks. The central timekeepers are less able to coordinate all of the individual clocks in your body and it’s easier for these individual clocks to get misaligned. Aging. As we get older the central clock becomes less robust and, again, it’s easier for the individual clocks to get misaligned. Artificial Light and Dark. Modern life allows us to be exposed to bright light at night and also to avoid exposure to bright light during the day and this makes all of us more vulnerable to circadian rhythm dysregulation. Winter. Our circadian rhythms naturally are less robust in the winter. This process is analogous to hibernation, although less dramatic. In the winter we naturally tend to sleep longer and less deeply and to be less active and wakeful during the day. This is because our light exposure is sometimes dramatically reduced due to weather and the shift in the sun’s axis. Fortunately science is coming to the rescue of those of us struggling with circadian rhythm dysregulation. Morning Light. Regular exposure to 30 to 45 minutes a day of bright light at the same time every day is the most powerful intervention that can help align dysregulated circadian rhythms. Bright light means being outdoors, not in the shade, or using a therapy light. No other form of lighting is strong enough to effectively regulate your central clock. We have a post that talks about therapy light options. Blue Blocking Glasses. We now know that it is only a portion of the light spectrum that affects the central clock: blue light. Unfortunately, many nighttime light sources are rich in blue light including TV monitors, computer monitors, fluorescent and LED lights and even your smart phone. Blue blocking glasses worn at night filter out this part of the spectrum and reduce the impact of artificial light. Blue blocking glasses can be bought from Amazon (Uvex safety glasses were tested by Consumer Reports and found to block almost all blue light) or from a company that specializes in making these glasses (your only option if you need to use them with prescription glasses). Melatonin. Nighttime melatonin is less powerful in its effects on the central clock but it can help. Temperature Regulation. It turns out that temperature also has a significant effect on our ability to sleep. We tend to go to sleep when ambient temperature goes down and we tend to as ambient temperature begins to increase. If you have central heating or central air conditioning with a smart thermostat you can help regulate your sleep by turning down the temperature an hour or two before bedtime and starting to heat the house an hour before you want to get out of bed. Read about a company that is developing a device to treat insomnia based on this phenomenon.